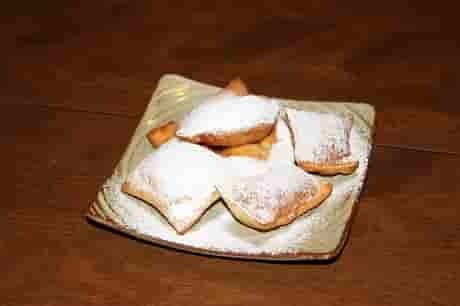 Cajun Mardi Gras Doughnuts, some call them beignets, are famous in New Orleans. Cafe Du Monde is famous for these. If you ever get a chance to visit New Orleans, be sure to stop there and try this with a cup of their great coffee. Mix the flour, sugar and baking powder together in a bowl. Make a well in the middle and add the eggs, milk, salt and vanilla. Beat these together and gradually work on the flour. Roll out on a floured board to about 1/4 inch or a little thinner if preferred. Cut the dough into 2 x 4-inch strips and simply make 3 or 4 slits in the center of each. Fry in deep oil until golden brown. Sprinkle with powdered sugar. HINT: These will be firmer than doughnuts. Mardi Gras is A great time to try these doughnuts! Recipe yields approximately 18 to 20 doughnuts.